Everybody’s busy. That’s just a fact of modern life. But some people, in spite of their busy schedule – their “have-to-do’s” to pay the bills or make the grade – still find time to give back. We call those special people volunteers. At Samaritan, our 470+ volunteers know that giving back to family, friends, and community matters. They tell us time and again that volunteering gives them a sense of fulfillment – that they feel blessed to take away more than they give! No matter who you are, what you’re like, how old you are, how much education you have or how much time you have to share, there is a volunteer experience that will excite your interests and match your skills to meaningful service in our community. It’s a great way to make new friends. Meeting and working with others engaged in a shared mission is a great way to “break-the-ice” and feel part of something good! It’s a proven way to learn new skills, build confidence, and develop professional connections.Your volunteer experiences are great resume builders. One study shows that 94% of employees who volunteered said that learning new skills helped them get their job. It’s good for your mental and physical health. In addition to relieving stress, The Healing Power of Doing Good by Allan Luks says that volunteering can improve a person’s sense of well-being, decrease insomnia, build a stronger immune system, and help speed recovery. Researchers talk of “helpers’ high” – a feeling of well-being that occurs when you are doing good for others. Other studies have shown that those who support others can experience lower mortality rates. So, this week, as the nation celebrates those who give back, make some time to check out one or more community organizations that would welcome your special gifts. Find Out About How You Can Volunteer at a Hospice Near You. 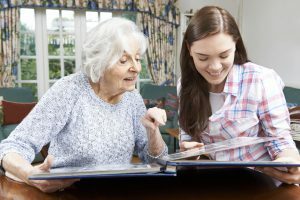 Patient/Family Support Volunteers: Volunteers go to homes, long-term facilities, and our inpatient hospice center to support patients and families by offering companionship, reading, playing cards, or sharing stories. This position offers volunteers the chance to be good neighbors to those who need it. Thrift Volunteers: Samaritan operates two thrift stores, in Westmont and Pitman, that help raise funds for our charitable mission. Thrift volunteers sort donations, maintain the cleanliness of the stores, and ring up customers. Retail experience is a plus, but not required. Administrative Volunteers: Administrative volunteers help in our main office in Marlton with typing, filing, collating, data entry, and many other critical administrative tasks. Their behind-the-scenes labors of love help Samaritan’s many programs and patient/family services to operate efficiently. SamariTeens: This group of 14-17-year-olds provides on-going support to Samaritan’s patients and families through visits, projects, and participation in annual events.There are many more options to choose from. But no matter which one is right for you, know that you will be making a difference for others while providing a host of benefits for yourself! We welcome you to our monthly Volunteer Information session.